You guys have waited a long time for this, but here it is! 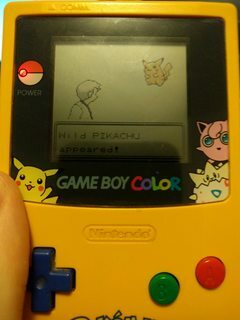 I finally remade my Gen II Graphics Hack for Pokémon Yellow! This is exactly what I've been waiting for! Question, I used to hack way back before disassembly and if I remember correctly pokemon data is in a different place to blue and red (if I remember correctly that was a big reason it was less used as a base), are the structures understood enough to expand the pokedex past 250? I wouldn't make this hack for the Japanese versions unless a disassembly of Jap Red, Blue or Yellow was made. And I don't imagine any of us making one soon. This is probably very doable. I may talk with ShantyTown and we might look into doing this. so the outside pallets arnt changed,pikaxhu has no cry? Yeah, the ow palettes have not been changed. Pikachu still has the same cry, so I don't know what you are referring to. The patch download makes the same rom that you get from the rom download, so the patch shouldn't be any more successful. And the rom loads on my flash cart just fine. Pikachu having no cry is usually a problem caused by emulators being unable to actually emulate it correctly. If you're having that issue on an actual GB/C flashcard then I guess your flashcard somehow doesn't support that. How do i put a GBC emulator like Lameboy into GBC mode? I've never even heard of that. Help, please? It should already be in GBC mode automatically. overall its a good hack and i like it but like the red/blue gen 2 graphics updated i would love to see a ow pallet change. I will consider replacing Yellow's sgb ow palettes with G/S sgb ow palettes. Are you able to confirm that the Pikachu cry glitch is a bug with your emulator? 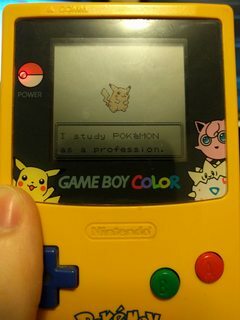 If it's a problem with your emulator, then Pikachu's cry should also not play on an ordinary Yellow rom. Thank You Danny, big fan of what you did for the Pkmn Hack/asm community. Works flawless on my Ipod touch and GBA4IOS. You are planning to create a full color version? Or isn't it so simply to Port, and you need to rewite everthing? How did they dis-asm the pokemon roms? I want to create the/a German version from it. I understand the concept from asm but i cannot realy write new stuff, so I have tryed first to translate the text in the asm manually but I have problems with the multi select text boxes, how can i change the possition of it? I can only find the values to change the high and width. In this way if i finish the yellow rom in the top4 (max. level ingame at 50), i could now play the crystal version (level normal to 100) with my pkmn in the PC, and access to them after the 8 gym ( so they have all an average level at 50), and then go to top4 in jhoto and then kanto again in very hard. I just uploaded version 1.1 which now makes the exp bar blue while playing in GBC mode! Note that when playing this in SGB mode, the exp bar will still share the color of your health bar. have you given any thought about changing the ow pallets to gbc colors? any word about color for the ow pallets? Has anyone updated this to also use Gen 2 tiles? @J92R hmmm no not much people hack yellow.